It is cold in February in a 6-8 knot wind with a hundred mile an hour air blast coming out under your feet. There have been six occasions, over the last 172 years, when a decisive advance in man’s mastery of the air has been reported. Five of these have been reports of the free balloon, the directible balloon, the gliding airplane, the powered airplane and the helicopter. Today’s triumph is called thrust-vector flight. Thrust vector flight. Thrust vectored flight using a fluid for propulsion. Sounds like our sport of jetpack/jetboard hydro flight. The quote is from 1956. Fifty eight years ago. True magazine, “The best selling men’s magazine” December 1956. We have a copy here in the Stratospheric office, it is great reading. Here is the backbone of the history as told in 1956, it goes like this..
There’s been no stranger tale in the history of aviation. And it holds the promise of human adventure utterly different from anything that has gone before. For years man labored to perfect an aeronautical device — a bubble of lighter-than-air gas, a planing wing, a pinwheel — to which he could attach himself as a sort of parasite. Now he has learned that he can successfully fly his, own body, with the aid merely of a pushing force under his feet. You don’t need wings, rudders, supporting framework or powerful engines. The only thing you need is a good steady push. The rest of what it takes to fly is built in ),on. It’s the sensing of gravity with your joints, tendons, and muscles that aviation doctors term “kinesthesia” — a fancy name for your instinctive feeling for body balance. And it works for you effortlessly. Push and balance. That’s all there is to thrust-vector flight. Its amazing simplicity opens the age of skycycles to everyone. It offers vast military possibilities, and a host of unexpected civilian uses once the human mind adapts fully to this new concept of individual man-flight. The man primarily responsible for thrust-vector flight is an aeronautical engineer named Charles Horton Zimmerman. He can’t recall exactly when he began to wonder whether a man could fly without ‘wings, but he believes it was in the fall of 1942. He was thinking about the effect of air on shoes. He was living near Stratford, Connecticut, a consulting engineer designing a novel war plane for Chance-Vought, which at that time was a division of United Aircraft Corporation. Chance-Vought made famous Navy fighters. It was serious work. Shoes were an off-hours subject for his restless imagination to toy with. Imagination had turned Charley Zimmerman toward aviation when he was about to start a career in another field. In 1929, while getting his B.S. in electrical engineering, he took a short course in aeronautics. It faced him toward the sky, and what he saw there fascinated him. During final examinations he filled out a Civil Service test for a job with the National Advisory Committee for Aeronautics. The job appointment came through. He eagerly re- ported to the NACA laboratory at Langley Field, Virginia, ready to conquer the air with plane designs that would make every man a Lindbergh. Instead, he found himself tending a cavernous, roaring wind tunnel. Various airplane surfaces were subjected to blasts of hot Virginia atmosphere and their deflections noted. The NACA didn’t design planes, he learned, but only studied them. Young Zimmerman read dials, jotted rows of figures, calculated. Sweating and bored, as he endlessly slipped his slide rule, he wondered if he should abandon aeronautics entirely. But things looked up at the laboratory; his work became more stimulating and responsible. He won recognition as an expert in the intricate subject of stability. He did research with a new, free-spinning wind tunnel, where models could be studied while they performed the downward spiral that too often ended fatally for real planes. The results depressed him. Conventional airplanes were skittish steeds for the average man. He decided to provide his own prospect, A competition was being held among NACA engineers for a useful personal-plane design. Zimmerman drew up something he’d been mulling over — a fantastic contraption consisting of a disk wing with two propellers up front. Theoretically unstallable, it would take off at a steep angle, fly level, and come down in a small landing area. Though it won the competition, the disk-wing design plays no part in our present story. (For a detailed account of it, See TRUE, July 1951, The Ups and Downs of the Flying Pancake.) The Pancake had, however, important side effects. Zimmerman’s imagination got him an offer from United Aircraft to convert his little light-plane design into a husky, quick-rising Navy shipboard fighter. While he labored over the plans of a metallic monster that grew continually heavier and more complex, he found himself remembering the Pancake’s original purpose. He’d wanted something safe and simple for personal flight. . . What other ways were there to achieve it? That was when Charley Zimmerman recalled an amusing fantasy about shoes. Since the earth’s air-ocean presses around us with its weight of 15 pounds per square inch flowing in all directions, it presses equally against the bottom and top of your feet. If you remove the air from the top surface of your shoes, the remaining pressure against the soles — some 800 pounds, less your weight of say 175, leaving a net lift of 625 — will shoot you upward like a skyrocket. Clean, cheap vertical flight. And if you could control the amount of air removed, you could go up fast or slow; or by a nice adjustment of thrust to weight, you could hover. But, Charley’s practical mind told him, it wouldn’t last long. Being top-heavy, you’d topple. High center of gravity would pass outside the line of thrust. Stability. It was Zimmerman’s specialty. From idle speculation about air under shoes he got what he himself describes as a wild thought. Can a man stand on a thrust vector? It was an idea only an engineer could conceive, and Zimmerman took pencil to figure it out mathematically. Zimmerman began as with all problems in stability: everything in balance. He aligned the arrows straight up and down, gave them equal values of force and mass, and located the man’s center of gravity. Then he began tilting the arrows,, letting the man pivot at the ankles. He calculated what would hap- pen, and what amount of force the man would have to apply in ankle twist to bring everything back into its previous balance again. He got some astounding answers. A man in mid-air, sustained by a force that he could tilt with his feet, could hold erect balance with less effort than he used in standing on the ground. If he should let himself topple over, he could wheel him elf upright with a quick bending of ankles or knees. And if he leaned a little and tilted his thrust to match, he could slide through the air. Here was an amazing set of possibilities that apparently nobody had explored before. Certainly nobody had ever experienced them. The physical laws of weight and thrust are constant-but how about the man? Would a man’s sense of balance stay with him in such a strange situation? Thrust-vector flight is the result of the simple interplay of two forces: the flier’s weight, and an equivalent amount of thrust under his feet. Motionless balance occurs when weight and thrust act along the same vertical line, as in position 1. If the flier starts to topple, his center of gravity moves forward, shifting his line of weight. (Position 2.) Sensing of this shift is felt in the soles of his feet, ankles, legs and body. He reacts instinctively as he would while standing on the ground: he presses down with his toes to tip himself back. This tilts the line of thrust. As soon as it slants ahead of his center of gravity (position 3), his feet are pushed forward under him. When erect once more, he eases up on the toe pressure, thus swinging the line of thrust vertical again and restoring the balance of position 1. Exaggerated in illustration, the movements actually are very small, effortless, and practically instantaneous. For travel through the air, the flier leans in the direction he wants to go. Holding this inclined position, he flies in a condition of suspended toppling that is neutralized by the thrust which is carrying him forward. He sets his speed by his angle of inclination, matching it with enough thrust to support him and meet air resistance. If the flier should happen, for any reason, to fall flat forward, or backward, or even head down, he can whirl himself and his platform upright again by simply bending his ankles or knees sharply. Though he will drop through space while doing so, the righting action is powerful and quick. 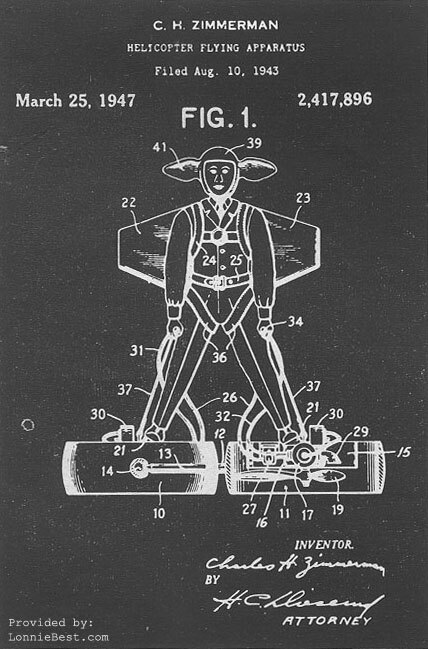 Inventor Zimmerman has calculated that the flier, flat on his back, can swing his body up to erect position in 7/10ths of a second, during which he will lose only about 10 feet of altitude. Being a practical engineer, Zimmerman ran a test. From his garage rafters he hung a simple swing-two ropes and a board seat. On the underside he fastened a vertical stick (representing the line of thrust) that fitted loosely in a hole in the floor. Then he tried standing on the seat with his hands at his sides. The foot-teetering that he did to prevent falling proved to him that a man’s instinctive sense of balance would operate through his feet to keep him upright. It was only a rough approximation of what might happen in vector flight, but it was enough to show what would happen. His first problem was a practical source of lifting power to replace his thrust-vector arrow. An airplane propeller blowing downward would do it. But the propeller would spin the flier. So that was no good. On evenings and weekends during his stay at United Aircraft, Zimmerman sketched and calculated. What he needed were two little lightweight engines-giving, say, 40 horsepower for 50 pounds of weight-which would drive two small propellers, one under each foot, rotating in opposite directions to nullify spin. This arrangement had a further advantage; by speeding up one engine, you’d get more push on that side for making a turn in horizontal flight. That’s what Zimmerman saw in his mind’s eye: a flier stretched out flat, spearing through the air at 190 miles an hour with an 80-hp thrust at his feet. To help support him at that speed, rudimentary stub wings would be strapped on his back; being hollow, they could double as gasoline tanks. Similar stubs sprouting from the sides of his helmet would support his head and relieve neck strain. If the propellers were enclosed in shallow tubes, they’d guide the air flow for maximum efficiency and help cool the engines as well. They would also serve as ring wings supporting the engine weight when presented edgewise in fast horizontal travel. Engine controls would be flexible cables held in the flier’s hands. The agonies of securing a patent have been known to leave inventors embittered for life. Charley Zimmerman bears only one slight scar after a four-year battle that would have flattened a lesser man. He winces still at the donkeylike ears, instead of stub wings, affixed to the flier’s helmet by a patent draftsman who evidently saw a chance for comic relief. Those ears probably did incite some of the hee-haws that greeted the invention later when Zimmerman sought serious backing. He filed his application August 10, 1943. The next two years he spent arguing legally with the patent office, which finally turned him down emphatically on the ground that Uncle Sam doesn’t grant a patent for something that won’t work. It was up to Zimmerman to produce a demonstrable machine. Not being a moneyed man, he couldn’t afford to have the work done by skilled mechanics. It had to be a build-it-yourself affair in his spare time. beam to carry an engine and propeller at each end, with standing room on the beam between them. The frame rested on four legs, fastened to two long timber skids for firm support while ground-testing. Engines were the big problem. Zimmerman considered himself lucky, in the middle of the war, to interest McCulloch Motors of California in his project. They sold him at cost — around $500 apiece — two of their target-airplane engines. These were little beauties-compact 2-cycle power plants of four cylinders each whose 75 pounds put out 60 hp. (Today, they’ve been perfected to put out 75 hp, or I for 1.) Moreover, McCulloch obligingly modified them for operation in vertical position, reversed one engine for left hand rotation, and substituted carburetors for the simple mixing valves that fed only full power to drone planes. Wood propellers 49 inches in diameter cost Zimmerman $100 when custom-made by the United States Propeller Company. With a friend’s help, Zimmerman got everything put together, attached motorcycle grip engine controls on two supporting rods, and castered the 190-pound device out of his garage into the driveway. It was August 1946. More than a year’s spare time, every spare minute, had gone into its construction. As Zimmerman anticipated, just standing on the beam with the engines going took nerve. The props slashed past only four inches from each leg — a discomforting thought, even though steel-plate leg guards stood between. And when testing alone, it was frankly dangerous; you had to start the engines by crouching down and swinging a prop tip. When everything checked out at idling rpm., Zimmerman gingerly advanced the power. The device seemed to take life. At least, it quivered promisingly. To be sure of not flying before he was ready, Zimmerman laid sandbags oil the timber skids. He also took time out to cast 50 pounds of lead in slabs shaped to fit over the skids. But troubles dogged him. The engines, not designed for stationary operation, overheated; one seized and he had to wait for new cylinders and pistons from the factory. He beat out curved sheet-aluminum air scoops that helped. The twin-power controls were bothersome. He tried an individual control in each hand, then a combined control ill one hand and a differential control in the other. Neither worked very well. The months passed by. The engines were sometimes stubborn to start. His hands ached and swelled from pulling on the props, and once he got a bad bang from a blade kickback. Despite recurring troubles, there were hopeful signs. Unweighted, he could rise unevenly an inch or two, and bounce and slither along the driveway. Photographs were taken. Armed with these and an affidavit outlining his background as, a respectable aeronautical engineer, Zimmerman and his attorney Journeyed to Washington to renew the patent application in person. That winter he trucked the machine to an isolated woods clearing, mounted the beam, and made an all-out, do-or-die test. Borne seemingly on its own thunder, the machine wobbled into the air. Charley Zimmerman, gazing down exultingly, estimated his altitude as three inches. He tried the foot feel. It felt steady and right … briefly, before the skids began bumping the earth again. On March 25, 1947, his patent was granted. It was acknowledgment at last that he had not wasted years of thought and effort and $3,600, of which some $1,200 had gone into legal expenses for patenting and $2,400 into his test machine. That spring he met helicopter manufacturer Stanley Hiller, Jr., who visited United Aircraft’s Sikorsky Division. Hiller had heard of Zimmerman’s experiment from Charles Lester Morris, Sikorsky’s test pilot who had pioneered American helicopter flying. Hiller and Morris showed up one night at Zimmerman’s house just before bedtime, Hiller wanted to see the new gadget. Charley led them into the garage where the machine was parked. He had a deal almost at once. Hiller took the machine to his California plant to see what he could make out of it. Hiller’s associates thought their young boss had gone off his rocker. Why fool with that thing, they argued, when he could sell helicopters for profit, which the company needed? The machine came back, with regrets, to Charley Zimmerman in the summer of 1948. The Pancake had then been canceled out and Zimmerman had left United Aircraft. He took the Pancake and the fledgling machine, which he christened the Aerocycle, and tried unsuccessfully to interest manufacturers Aerocycle and the armed services. Though some were polite enough not to say so, no one believed in the Aerocycle. Thrust-vector flight had failed to get off the ground — unless you count three inches — and it seemed unlikely to do so now. This story might have ended there if it weren’t for a lanky NACA engineer named Paul R. Hill. He welcomed his friend Zimmerman back to the Langley Field laboratory and, as time went on, grew interested in the theory of the Aerocycle. His interest bloomed into enthusiasm. He considered it a shame that the exciting thrust-vector principle hadn’t been adequately tested. One usable source of thrust, he decided, would be a high-speed jet of Air issuing from a nozzle under a board on which to stand. As assistant chief of the Pilotless Aircraft Research Division, he had lots of compressed air. Huge steel tanks at Wallops Island, the NACA model-launching station on the Atlantic Ocean front, stored tons of it at a pressure of 200 pounds per inch. In the summer of 1950, he and Zimmerman were given an OK to experiment, and Hill went into training. He practiced standing on a board balanced across a bowling ball. Not the same thing at all, Zimmerman pointed out. Good reflex training, Hill retorted, and miraculously mastered the trick without breaking a leg. On February 2, 1951, in a large building on Wallops Island, Zimmerman mounted the jet board, a plain plywood rectangle, and slipped his feet under straps. Two flexible air hoses made a T connection with a short nozzle of 1 1/4-inch diameter that poked down through the center. Men stood ready at valves some distance away. An overhead crane hoisted him on suspension lines attached to his parachute body harness until he hung a few feet above the floor. Zimmerman signaled for the air to be turned on. A piercing scream issued from the nozzle beneath him, but he felt nothing, no lift, no sensation. Then he glanced up at the suspension lines. They were dangling slack! He had risen and was now actually balancing on a jet thrust — and he hadn’t been aware of it! For a full minute he stood there, in motionless wonder, then signaled and was let down. It worked. It worked beyond the best anticipation of his theory. 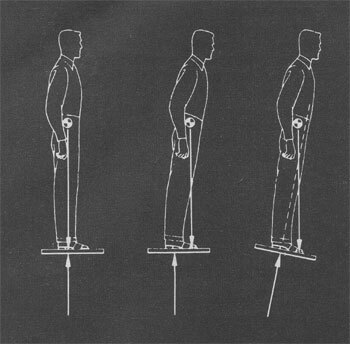 Balance control through the feet was so instinctive that it operated below the level of conscious thought. He went up and experienced it again. Paul Hill tried it. Testing further, they found that besides hovering perfectly by not thinking about it, you could control consciously, too–but here you tended to teeter your feet unnecessarily in a flurry of overcontrol. But you could travel without effort. Almost the wish alone caused imperceptible leaning and foot tilt, taking you to where you wanted to go, and stopping )’On when you reached there. Paul Hill became adept at sashaying around the 15-foot circle to which the dragging hoses limited him. Outdoors on a windy day, flights were hardly affected by breeze or gusts. You compensated automatically by leaning a little to stay in one place. Charley Zimmerman was satisfied. Thrust-vector flight had been established. Paul Hill went on to try, in 1953, an approach. He devised a test machine in-, instead of a jet, a seven-foot two-bladed rotor for thrust, whirled by compressed air, with a small railed plat- I form for the flier. Its greater weight — 140 pounds Against the jet board’s 30 — slowed its responses. You couldn’t wobble it quickly and you leaned a bit farther to start it traveling. Otherwise, it behaved quite similarly. News of these activities at NACA got around in channels that were entitled to receive confidential government information. Visitors came to “ride the board.” Most of them did well. A few at first swung like flopping fish on the safety line. It wasn’t a question of skill-which wasn’t needed-but confidence. Visitors came to “ride the board.” Most of them did well. A few at first swung like flopping fish on the safety line. It wasn’t a question of skill-which wasn’t needed-but confidence. Charley Zimmerman had the gratification of seeing his idea for cheap, safe personal flight take form in two different flying platforms. Gladly he waived his patent rights to permit their experimental development. The Office of Naval Research put out requests for construction of a thrust-vector device. Stanley Hiller’s company took the job. Zimmerman and Paul Hill sat in with Hiller engineers to advise on a design. It was decided to try an entubed-propeller system-the NACA had been investigating “ducted fans” for vertical take-off airplanes-and Hiller began work in January 1954. Lewis McCarty, Jr., built his platform as a private venture. A capable designer with experience in helicopters and flying boats, McCarty had heard Paul Hill read a paper on the jet-board trials at a closed meeting for helicopter engineers. Captivated by the idea of foot-guided flight, McCarty drafted his design in the spring of 1954 and obtained the approval of Zimmerman and Hill in June. Both machines were completed and rose from the ground in January 1955 — McCarty’s in New York, the Hiller in California. What you can expect from thrust-vector flight is hardly more than hinted at by these first two models. Nevertheless, comparing their qualities is instructive, both for advantages and for shortcomings. Let’s look first at the Hiller platform. Two opposite-turning propellers, geared to two engines of less than 100 hp, produce an air stream for thrust. The air enters around a latticework platform surface supporting the engines and pilot. Enclosing all is the duct, a lipped tube of Plexiglas and plastic. It gives efficient air flow and propeller protection, and the curved rim adds stability in sideward flight. When tilted for travel, the “forward” or leading half of the ring will generate more lift from the faster flow of air over its lip-curve than the rear half. If anything, the machine has too much stability; its self-righting tendency is a limiting factor in its speed. McCarty’s Heli-Vector, built by De Lackner Helicopters, Inc., for whom McCarty was consulting engineer, gets its thrust from large, uncaged, semi-rigid blades. Two 15-foot rotors are belt-driven in counter-rotation by a stock, four-cylinder Mercury marine outboard motor that turns up 43 hp at 6,000 rpm. The Heli-Vector’s landing gear — an inflated central rubber doughnut and four outrigged floats — cradles the machine on land or water. Control is pure Zimmerman weight-and-ankle action in the Hiller. You lean -she goes. The Heli-Vector also uses body control but supplements it with a handle bar for steering right and left. Turning the bar slows one rotor slightly; in hovering flight this causes the machine to pivot, and in forward flight banks it around a gentle curving path like an airplane. Putting thrust-vector flight on a familiar psychological basis of manual steering may be desirable or not; practical experience will tell. Fastest-speed predictions are a comfortable 35 mph for the Hiller, which calls for goggles, and a heady 65 for the Heli-Vector, with which you’d probably want a windshield. How high will they go? Hiller isn’t saying, but his near-100 hp has a vaulting potency. On only 43 hp McCarty expects the Heli-Vector to climb above 5,000 feet. Both machines, at this writing, had been cautiously held a few yards off the ground. Distance depends on fuel capacity, which in turn depends on space and load-carrying ability. The Heli-Vector’s normal 2 1/2-gallon supply gives a 60-mile range, but its large weight-lifting capacity-estimated at 300 pounds more than its 200-pound empty weight-has leeway for extra tanks yielding more mileage. For the Hiller, neither weight nor fuel has been divulged. An announced 20 minutes’ flight time can cover presumably about 12 miles. And what of safety? Here the single-engined Heli-Vector is a step ahead of the two-engined Hiller. The large rotors are designed to free-wheel in case of power failure and let the flier down, helicopter-fashion, in a reasonable glide. The Hiller ducted-fan has little in reserve; if one engine conks, the other can keep both small props turning, but not fast enough to prevent a hard drop. Stand-up flight is in its toddling stage today. For one thing, no present flying platform — jet board, Hiller tube or Heli-Vector — will stay right side up in free flight without correction from its human rider. It needs balancing, like a bicycle, which you provide without conscious attention. out and you lack visual reference, which is an important factor in equilibrium. The aerial scooter of, tomorrow will probably be a convertible, with a plastic canopy to protect you from the -weather. Right now a lot of figuring is being done behind closed doors to enlist big and little platforms for military use. Much handier and cheaper than helicopters, they can handle field liaison, artillery spotting, air search and rescue, and photography. Not to mention such specialized work as pin-point bomb laying, spy transportation, and traveling snipers’ nests. The Army has ordered a dozen each of the Heli-Vector — which it has rechristened “Aerocycle” — and the Hiller platform, as test vehicles for giving infantrymen more mobility. Contrast this with a simple flying platform. Less complicated than a motorcycle and costing not much more, it can be flown by anybody with a few minutes’ coaching. Now we have the answer to who invented thrust vectored individual flight, and the guy that invented the jetboard. Charles Horton Zimmerman, C.H. Zimmerman.